This flat screen box packs your screen, stands, hanging brackets, and most speakers safely into it. 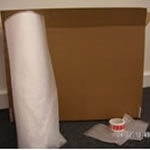 Also included is 1 bubble wrap mini roll , 2 protective bubble bags for remote controls and a roll of fragile tape. Size: 1000mm X 235mm X 660mm (Length x Width X Height - 32"
Size: 1320mm X 235mm X 780mm(Length x Width x Height) - 43"